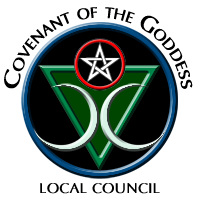 Covenant of the Goddess Touchstone Local Council serves the San Bernardino and Riverside counties of Southern California where there are an estimated eight thousand Wiccans and Witches in residence. Touchstone Local Council will once again be participating in the Inland Empire's Pagan Pride Day and Autumn Harvest Faire! Can you believe they've been doing this for twelve years already?! This awesome event is being held at the California Citrus State Historic Park in Riverside, California (just like last year), from 10 am to 5 pm. It's going to be a fantastic and fun-filled day! There will be a variety of vendors (including our own Lady O and the Enchanted Crystal), lots of entertainment, several workshops and a family craft area for kids of all ages. Be sure to check their schedule for updates! Touchstone Local Council will be providing a walk-at-your-own-pace meditational labyrinth laid out in bird seed and will also be doing tarot readings for a small donation. Although there is no admission fee to the Harvest Faire, please bring a can of food (or more!) for donation to the local food banks in our area. If you donate two cans of food, you will receive a carnival ticket which entitles you to play a carnival game for a fun prize.